I love to bake, but there are times when you just want a no bake dessert. It could be for unexpected guests, a craving or maybe you just don’t want to turn on the oven. 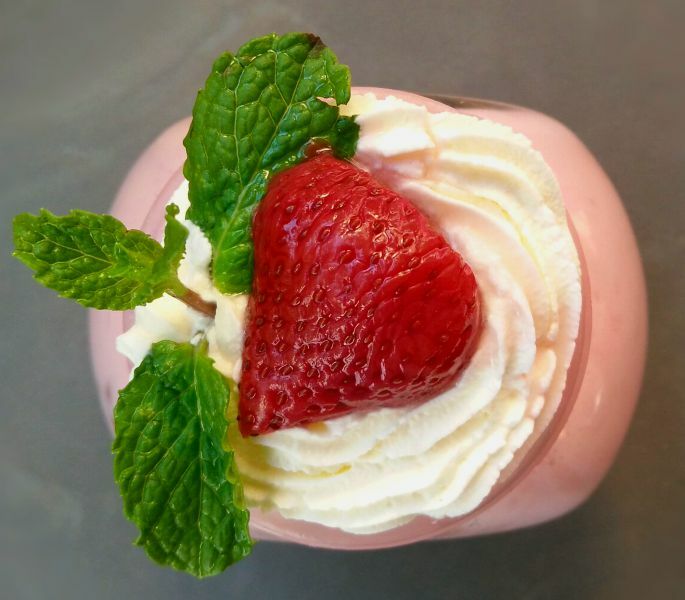 Strawberry Cheesecake Mousse is of my favourite No bake desserts which require just an hour to set and tastes and looks absolutely amazing. Remember this is not a cheesecake which you set in a springform tin and unmold hours later. 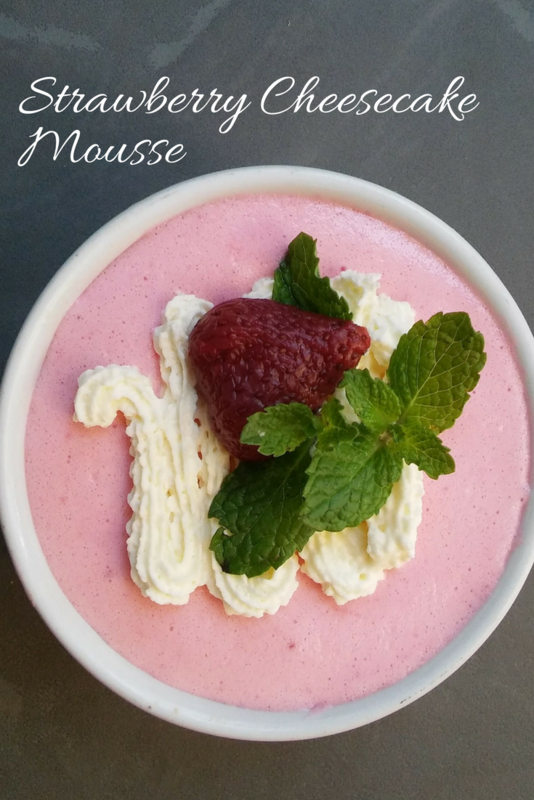 It is just a cheesecake mousse and has the characteristics of both the cheesecake and the mousse ….being slightly firm as a cheesecake and slightly airy like a mousse. So pleeeeeze do not try to set it in a tin to unmold later because it does not set and cannot be cut into like a cheesecake. It will just fall apart ( Yes, I tried to see if there just might be a chance of it setting…there was none…it fell apart. But well on the bright side, my two boys were happily ready with spoons to catch the mousse falling out onto a plate. 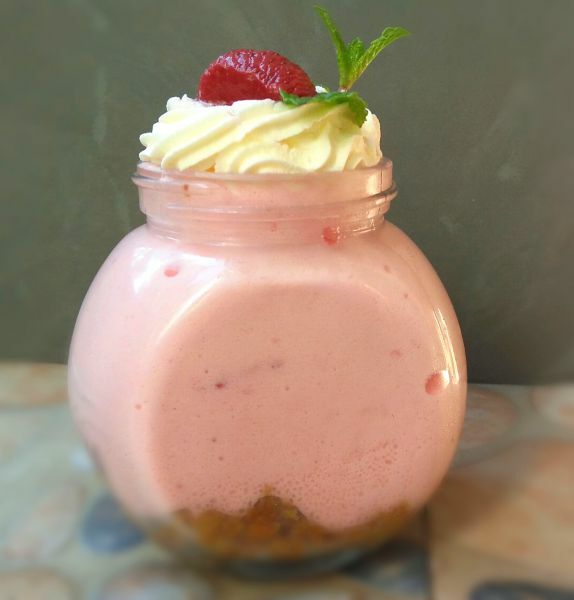 Just allow to set in the fridge in ramekins, mason jars or little dessert cups for about an hour. It will have an airy slightly firm texture. This recipe has jelly / jello in it as one of the ingredients, and being a vegetarian I use jelly / jello which is free of gelatin. Bakol Jel Dessert makes an excellent substitute for jelly/jello if you are vegetarian or possibly hosting a party or event with vegetarian guests or even if you just want to use a gelatin free product. However if you prefer, you can also use your regular jelly/jello as it does not affect the recipe. It is just my choice to use the vegan option. Another ingredient, I would like to mention is the use of canned evaporated milk. I usually use evaporated milk instead of heavy cream because the evaporated milk has far lower calories than the heavy cream…..which means … YAY… you can go for second helpings in this dessert. And be honest, who doesn’t love an extra helping of dessert? Just ensure that you chill the can of evaporated milk for a few hours before using, otherwise it might not whip up well. You need it to be whipped to double its volume. This is a really simple dessert to prepare and you are going to love it. Crush plain biscuits / cookies in a food processor or place in a bag and bash with a rolling pin. Place about I Tablespoon of the crushed biscuit/cookie mix at the bottom of each serving bowl and press in with a spoon to firm and compact it. Dissolve the jelly powder in 150ml boiling water and set aside. Beat the evaporated milk until doubled in volume and light and fluffy. Pour onto the compacted cookie mix and refrigerate for about an hour until set. 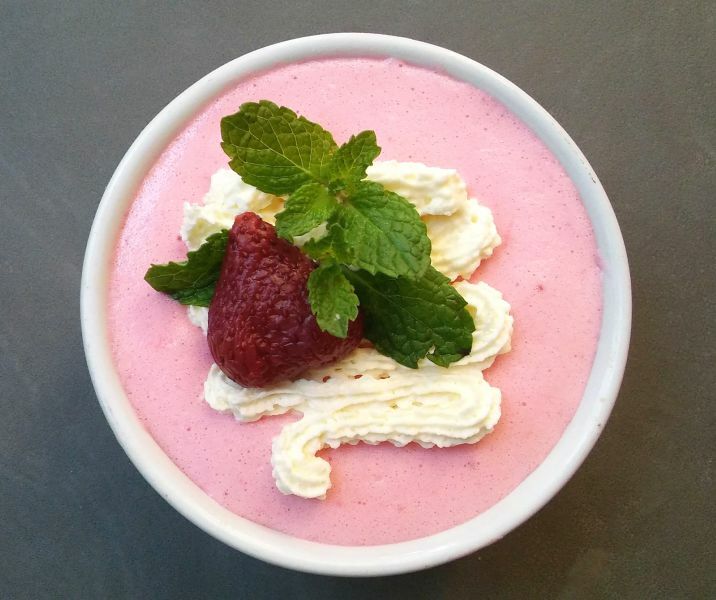 That looks so creamy and airy…a perfect dessert for hot summer days. Thank you Angie…yes it does make the perfect Summer dessert.? Cheesecake is one of my favorite desserts, but I never want to make a whole cake for myself. This is my answer . So pretty as well. The cookie base is a great way to use up the cookie crumbles left at the bottom of the bag! Thank you Patrick…I know what you mean about never wanting to make a whole cake yourself, these individual ones are really perfect. But believe me after you try this recipe…you will want the whole thing for yourself, it is very yummy? 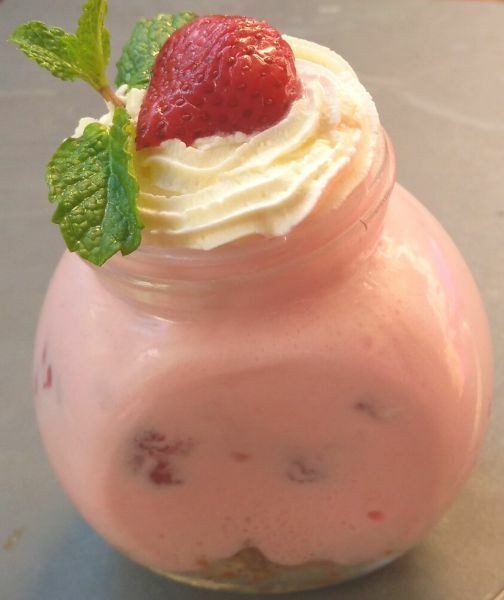 As a huge fan of cheesecakes I completely approve of this delicious summer strawberry cheesecake mousse! 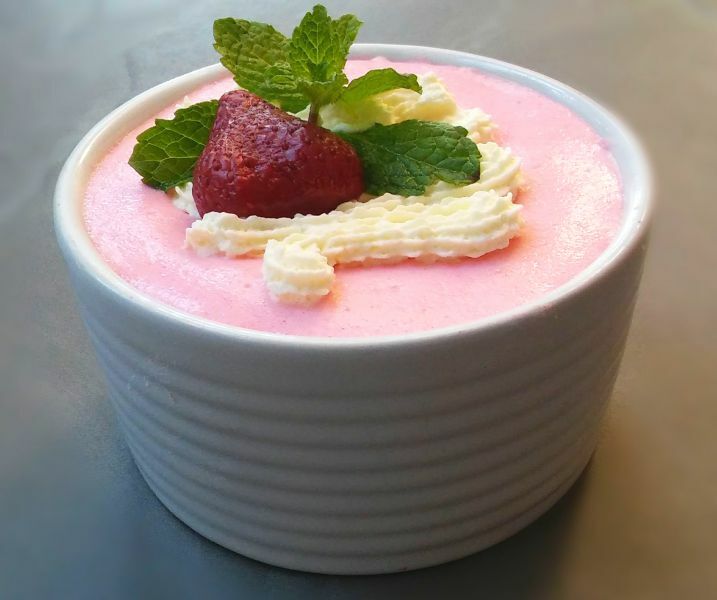 Oh yes you can never go wrong with this strawberry cheesecake mousse as a summer dessert, it is perfect. The only thing that I like about winter is that it brings out the baking monster in me…love to bake on cold days.? Thank You Kelsie, this is a very difficult dessert to share,? that is why I make individual ones, everybody gets an equal share…so less fighting over who got more. ? Thank You Dawn, I’m glad you like the recipe. Seconds…mayyybe thirds is a must with this dessert? I was just mentioning to Kelsie @ itsybitsykitchen that I have never baked a cheesecake until now. This looks like a good place to start without all the fear of collapsing one. 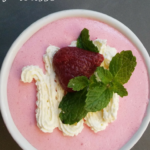 Oh definitely a ‘collapse proof’ cheesecake mousse, I have had my share of problems with baked cheesecake,so this seems to be my best alternative.? ?Haha, I know what you mean, it was difficult enough taking pictures of this dessert with my boys impatiently asking are you done yet, can we eat it now? Thanks for stopping by, have a great day? Yum! This sounds so good! Although I’m afraid that a slightly more fluffy cheesecake will result in me not being able to stop eating it! Thank You Stacy, I know what you mean, it is difficult having just one serving of this dessert…it is really Yum. Thanks for stopping by, Have a great day!? Thank you Kelly,Oh yes it is perfect for summer…though in my home…it is in demand all year round.? This looks SO cute, especially in the little glass pot. I’m a sucker for anything in a cute jar! Recipe sounds fantastic, no bakes are the best when it’s hot outside but you still need a sweet treat! Love it! Awww, thank you Kay, I love serving dessert in cute tiny jars,which don’t always go down too well with my two boys who argue that the serving is tooooo little.? I am really glad you like the recipe,it is really delicious. ?